Let’s face it—we’re all looking for shortcuts to help manage our businesses and social media interactions more efficiently and effectively. One of the best ways to make your social media activities run more smoothly is outsourcing—having someone manage certain tasks for you. But when it comes right down to it, there are certain things that shouldn’t be outsourced, and there are really good reasons why “you” need to be a part of your social media strategy. In fact, if you’re thinking of hiring someone to manage your social media accounts and handle your online networking, you may want to think again, because you might end up with exactly the opposite of what you’re after. This article will look at social media tasks and what should and shouldn’t be outsourced, to see maximum results for your small business. Your profiles across social media platforms generally include the same standard details. Your name, a short bio, web address and a standard-size photo. Provide your assistant with a short bio and a picture of you, and he or she can edit your image to the right size for each platform and set up your profiles pretty easily. 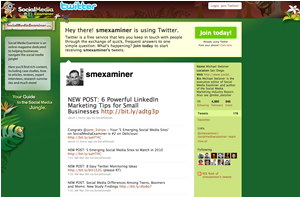 Twitter allows you to set up a background image on your profile (like the @smexaminer one shown here). This background image is valuable real estate for branding and traffic generation. Facebook allows you to set up custom programming in FBML on fan pages, giving you the opportunity to share more about your business, express your branding, draw more traffic to your website and increase your subscriber list. This is something you can easily outsource, and if you’ve got a solid team in place, it shouldn’t be too challenging for your designer and web developer to whip up something that expresses your branding, coordinates across your website and all of your social media profiles and captures leads. There are several online Twitter directories where you’ll want to be listed to maximize visibility. On Facebook and LinkedIn, you’ll want to find groups that align with your business interests and the interests of your target market. Your assistant should be able to find these groups and sites, know which ones make sense for you and set up your listings. There are some status updates you want automated, and others you don’t. You definitely want your blog updates automatically submitted to social media sites. It just makes good sense to automate your blog RSS feed, so each time you add a post to your blog, it gets fed into your social media accounts. As long as you’re providing valuable, authentic blog posts (versus salesy junk), broadcasting your blog will be seen as sharing interesting and useful content. I’ve also had my assistant set up automated status updates and tweets for specific purposes. For example, during a product launch, we’ll schedule two or three automated posts at strategic times throughout the day to direct folks to the product site. We’ll include some other scheduled tweets with relevant, useful information that’s of interest to my followers. But since this represents “broadcasting” (sending information into the Twittersphere and other social media without actually engaging), these automated tweets do not represent a substantial percentage of my overall tweets or status updates. Specifically related to Twitter, some third-party applications like TweetAdder allow me to research my target market, locate them on Twitter and automatically follow and unfollow various people. Even though this is a relatively easy automated process, I don’t really want to let it run on its own, which means that I would normally have to check in now and again and tell the application to start and stop these processes. This is certainly something my assistant can handle. There’s no big list here. 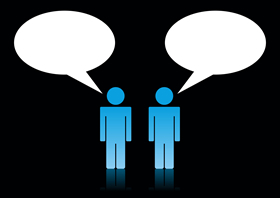 The bottom line is that social media networking is about the conversation—so don’t outsource that! The best way to build your social media networking strategy is to connect and engage. And you just can’t do that with by broadcasting an “I want to hire someone to do it all for me” mentality. As Al Ferretti and Skeeter Hansen (of TwitterWatchdog.com and TweetFormula.com) (and similarly, Jason Falls in this interview) suggest, the benefit of Twitter (and likewise, of social media in general) is in the conversation, and if you simply broadcast without interacting, you’ll blend into the noise and lose followers when they get the feeling that you just don’t care about them. Your followers and fans aren’t doing business with a computer or a feed, and you don’t want them to get the sense that you’re not really even there. If you’re looking to economize your time, make your social media activities more efficient and see real results in the form of increased web traffic, brand visibility and lead generation, then automate everything but the part where you interact and engage with people. It’s actually quite simple—automate the impersonal technical tasks, but spend 10-15 minutes two to three times throughout the day checking your Twitter and Facebook feeds, retweeting, sharing, replying to what people are putting out there and having conversations. Share your followers and fans with other people and connect your followers to each other. Get involved and engaged, and get to know the people who are following you. It’s all about the interactive experience, the conversation and engagement. So when you look at your social media strategy, before you decide to hire someone to manage your social media accounts for you, remember that people do business with people they know, like and trust. 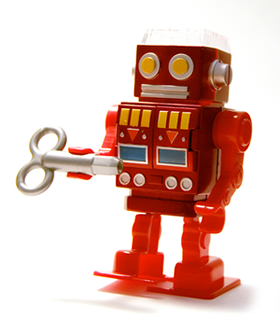 What are your experiences with outsourcing and automating social media? Have you tried having your tweets and status updates outsourced? What was the result? Susan Baroncini-Moe is a small business advisor to coaches, consultants, and experts. She publishes the e-zine No Suits Allowed! and hosts "The Experts Series"